alaTest has collected and analyzed 335 reviews of Canon Vixia HF200 / Legria HF200. The average rating for this product is 4.2/5, compared to an average rating of 4.0/5 for other Camcorders for all reviews. People are impressed by the image quality and size. The price and portability also get good views, but many are critical about the viewfinder and battery. We analyzed user and expert ratings, product age and more factors. Compared to other Camcorders the Canon Vixia HF200 / Legria HF200 is awarded an overall alaScore™ of 87/100 = Very good quality. alaTest has collected and analyzed 34 user reviews of Canon Vixia HF200 / Legria HF200 from Amazon.co.uk. The average user rating for this product is 4.4/5, compared to an average user rating of 4.0/5 for other Camcorders on Amazon.co.uk. Opinions about the size and durability are overall positive. The image quality and portability also get good feedback. There are some negative views about the battery and viewfinder. alaTest has collected and analyzed 74 user reviews of Canon Vixia HF200 / Legria HF200 from Amazon.com. The average user rating for this product is 4.1/5, compared to an average user rating of 3.9/5 for other Camcorders on Amazon.com. Opinions about the size and image quality are generally positive. The price and portability are also appreciated. Some have doubts about the reliability. It records AVCHD video to SD/SDHC memory cards, which is swiftly becoming the dominant video format in the consumer market. 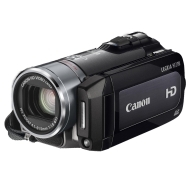 The Canon Legria HF200 is a solid HD camcorder that boasts some useful, no-nonsense features. While there are better camcorders on the market, it does a great job for the asking price. The Legria HF200 is the cheapest model in Canon's revamped HD camcorder range, but at just under £600 it's still the most expensive model here. The Canon Legria HF200 is a midrange high-definition camcorder aimed at videographers on a budget. Broad manual feature set unusual in a camcorder its size; excellent video quality; attractive, functional design. Does what it says on the tin, easy to use and very compact,excellent lens quality as would be expected from Canon,the accessory pack is excellent value. No s/d card with camera and short battery life. Small enough to carry with you everywhere, the LEGRIA HF200 records stunning Full HD movies straight to SDHC memory cards - perfect for passing on to friends or uploading to the web.